Cloudy skies. A stray shower or thunderstorm is possible. Low near 50F. Winds ENE at 10 to 15 mph..
Cloudy skies. A stray shower or thunderstorm is possible. Low near 50F. Winds ENE at 10 to 15 mph. Alan Beaman, center, walks out of the Champaign County Courthouse in Urbana with his parents, Carol and Barry Beaman, in 2013 after winning a certificate of innocence in the murder of Jennifer Lockmiller, his former girlfriend who was slain in 1993 in an apartment in Normal. SPRINGFIELD — The Illinois Supreme Court has reversed an appellate ruling that denied Alan Beaman the right to a trial on his claims against the town and three former Normal police officers involved in an investigation that led to murder charges against him. 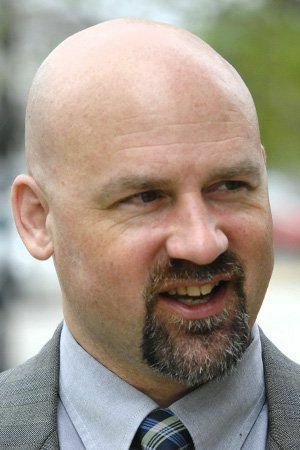 The ruling issued Thursday sends Beaman's case back to the 4th District Appellate Court in Springfield for more consideration of Beaman's claims against former investigators Tim Freesmeyer, Dave Warner and Frank Zayas, all retired. Beaman was convicted of murder in the 1993 strangulation death of his former girlfriend Jennifer Lockmiller, a 21-year-old Illinois State University student from Decatur. The Illinois Supreme Court reversed Beaman's conviction in 2008 after he had served about 13 years of a 50-year sentence. The state later dismissed the murder charges against Beaman. In 2013, the state issued a certificate of innocence to Beaman and in 2015, then-Gov. Pat Quinn pardoned Beaman "based upon innocence as if no conviction." David Shapiro, one of Beaman's lawyers, said Thursday: "This important precedent is Alan’s second unanimous victory in the Supreme Court. He will continue his lifelong fight for justice and accountability. It’s an honor to represent him." In the decision that revives Beaman's civil lawsuit, the Supreme Court advised the appellate court to review whether the detectives' direct involvement in the case was a proximate cause of criminal charges being filed against Beaman. Attorneys for the town and the officers contend the decision to file charges against Beaman was made by prosecutors and not the officers. Shapiro argued to the Supreme Court in September that the lower court erred when it dismissed Beaman's lawsuit alleging misconduct by the three officers. The appellate court concurred with the lower court decision. Beaman's lawyers contend Freesmeyer lied to a grand jury considering indictments against Beaman by withholding information of a second suspect, a man who had dated Lockmiller and had a history of drug use and domestic violence. The alleged improper influence by the Normal investigators on former prosecutors led to the malicious prosecution of Beaman, his lawyers argued. Federal court actions filed by Beaman against the officers, the town and former State's Attorney Charles Reynard and former prosecutor Jim Souk, who both went on to serve as circuit judges, were unsuccessful. Souk and Reynard were dropped from the lawsuit based on immunity, and claims against other defendants also were dismissed. In 2014, Beaman filed a lawsuit in state court against the three former officers and the town alleging malicious prosecution, emotional distress and civil conspiracy. Beaman resides in Rockford with his wife and two daughters.